Today I’m showing off my new painting setup! Let me start today’s entry by saying I am a very mediocre painter. In the coming weeks I’m going to be spotlighting the tips and items that I use to cover up my paint skills. Before we get to them though I have to talk about where I put all of these things together and since I just put together a new space to do all my painting I figured I’d show it off. I just set it last night, so you’ll notice that there aren’t any works in progress on the table. The desk was something my mother found at a garage sale. It was initially intended for my wife, but she has found something that is more her style. That’s when I got the bright idea to use it as a painting table. 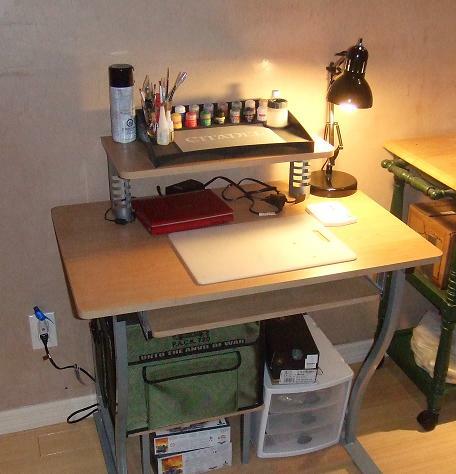 On the top shelf is Game Workshop’s painting table. When I was originally just using our kitchen table to paint I needed something that was easy to pick up and put away. On the main desk surface is a really cheap cutting board, a desk lamp, and a portable DVD player. I like watching season sets while painting. Currently I’m on season 3 of Chuck. Before that were Black Sheep Squadron and BJ and the Bear. 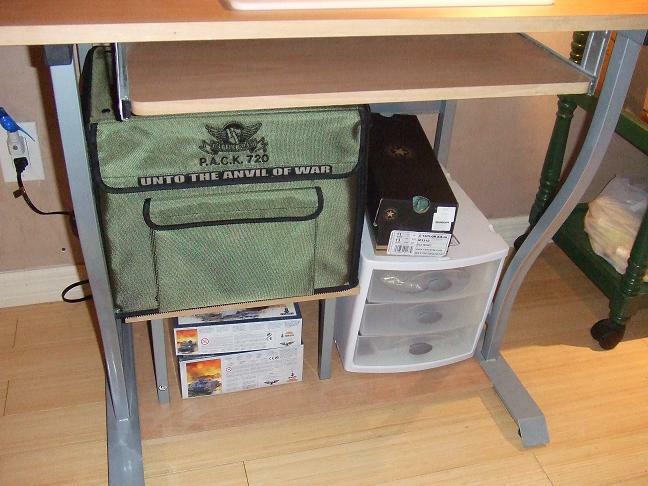 Below the desk I have space to store my Battlefoam 720 troop carrier. We will definitely be talking about that in a later entry. The white container with the three drawers is my bits box. I get pretty OCD about bits, inside those drawers all the bits are grouped together in tiny zip lock bags. One bag is full of backpacks, another arms, another heads, etc… Below the Battlefoam are boxes for the two tanks and assault bike that I need to put together. I almost forgot, I use the Converse shoe box when I got to my local store and paint. It's useful to carry around all my paint supplies. Flash Friday: What Would You Accept?